If you would like private instruction or help to learn hand engraving or you would like to suggest a class that you would find helpful, please contact one of the endorsed instructors at EngravingClasses.com Instructors, students or any one on the engraving forum is welcome to make private rooms and use the video conferencing area in any useful manor to themselves and to the over 5300 member community on EngravingForum.com. Instructor note: Following are two options to set up classes for one or more students in the Graver Video Conferencing area. 1: For a class with more than one student. 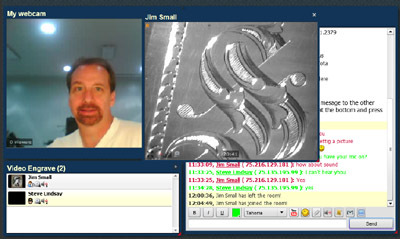 Post on EngravingForum.com to announce that you will be teaching a class. Publish the time and date and briefly cover the curriculum plan for the class, cost and payment methods. You may want to make a paypal buy-now button and post it in the same post so students can pay easily. If you need help making a paypal buy-now button please email here for help with it. 2: For a private class you and the student may decide by email or other communication, the time, date and price per hour you charge. The conferencing software has other options that are currently turned off. One is file sharing and uploading files to rooms. If you feel this would be helpful, let us know. Also there are many streaming resolution settings if you would like it adjusted. 1: Create a new room and name it as you chose for your class or personal instruction. When you make the room it will give you an option to make the room password protected. Chose this option. Notify the student or students by email what the password and name of the room will be. 2: When you are in your room and you are ready to broadcast video, click the button in the upper left titled "Start my Cam & Mic". By default the streaming video is set to "public". Set it to "private" by clicking on the arrow at the upper right of your video picture. This will open a menu. Uncheck the setting titled "Stream is Public". This will prohibit casual visitors from seeing your streaming video. They will still be able to see anything typed in the chat text area. If you want to prohibit this, use the first option with a password to protect the room.